Two young men become friends in the middle of a war. Life separates them and leads them to Shanghai, Barcelona, Prague, Havana, Girona and Moscow. They don’t see each other again until, thirty years later, a coincidence allows them to resume the relationship, albeit with difficulty. These two real characters, František Kriegel, a Czech communist doctor, and Jaume Ministral, a Catalan writer and teacher, experienced an intense friendship shaken by the political, military and social upheavals of the last century. Two fictional researchers from the Empordà, Dacs and Tarongi, embark on the adventure of recovering this fascinating story. 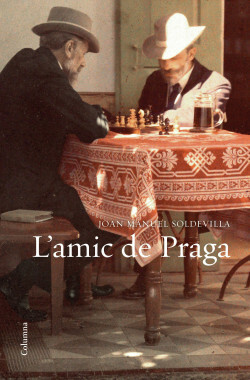 With its combination of real documents - letters, press releases, memoirs, police reports - and literary recreations, The Friend of Prague is presented as an intense narrative exercise in which readers, at the same time as the two researchers, reconstruct a friendship that is, at the same time, a frontline portrait of recent Europe. A story so true it could only be told as a novel.